It's not the best of photos, and my camera zoom was at the limits before things really get out of focus, so I did the best I could. 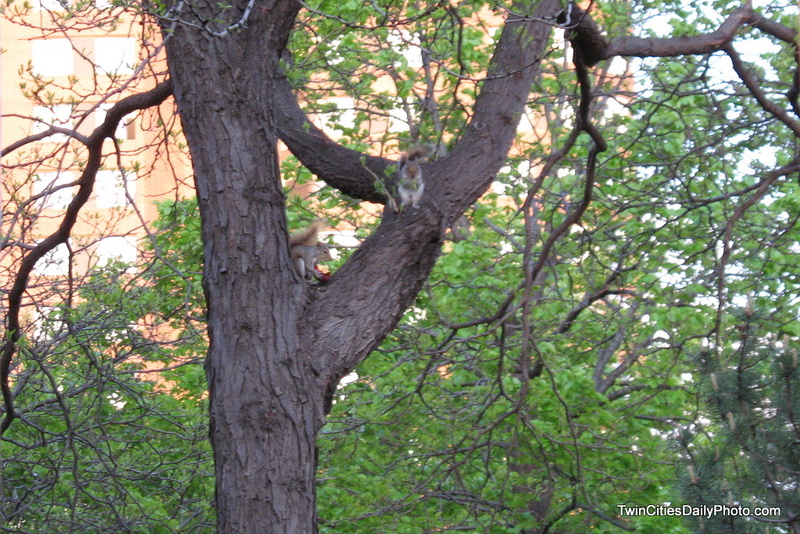 As I was walking around downtown Minneapolis, I spotted two squirrels running and chasing each other. One of the squirrels and a big red apple in it's mouth as it ran. It was quite comical to see. I was thankful the pair finally made their way up a tree and posed for me. Seriously, it honestly looks like they are posing for the camera shot, almost as if they knew I wanted to take their photo. Though I suppose they could have stopped to see if I was a predator or not.